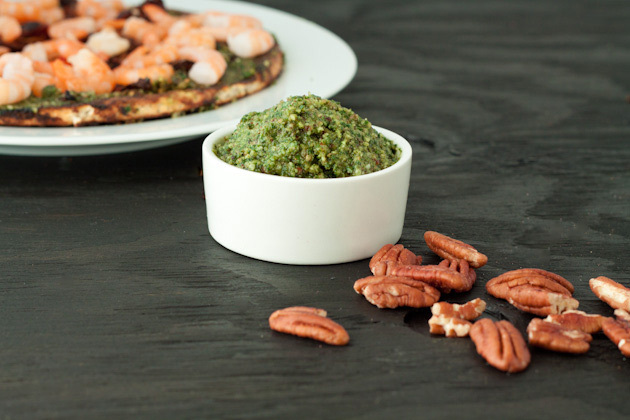 The Thai basil gives this pecan based pesto a warm licorice taste. Thai basil has an identifiable licorice flavor not present in sweet basil and holds its flavor much better when cooked in higher temperatures. It exhibits small narrow leaves with purple stems and makes a great addition to green smoothies! Place nuts in the bowl of your food processor and pulse until broken down, about 30 seconds. Add basil, lemon juice, garlic, and salt. Pulse to mix, until basil leaves have been incorporated with the nuts. 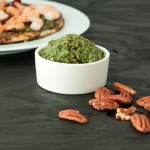 Add olive oil and process until combined and until pesto has reached desired consistency.